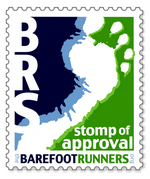 John's Barefoot Running Blog: ON FOOT now available! ON FOOT: Grand Canyon Backpacking Stories, edited by Rick Kempa, is now available! Featuring my essay "Holy Water" among many good ones, including one by a Barefoot Running Society member on hiking barefoot! Vishnu Temple Press is offering free shipping through September. Click on any link to go there and order.